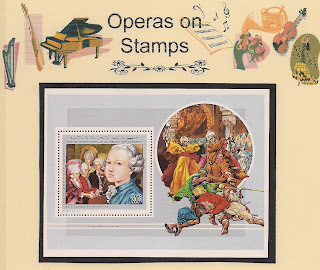 Opera in 3 acts by Handel; libretto by Vincenzo Grimani; premiered in Venice on December 26, 1709. It is Handel's only one of two operas produced in Italy during his three-year stay(other-Rodrigo). 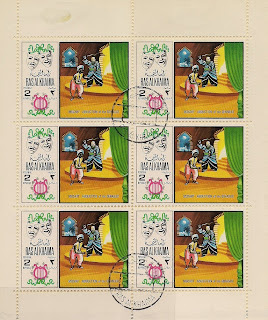 Fra Diavolo is an opera comique in three acts by French composer Daniel-Esprit Auber, first performed at the Opera-Comique, Paris on January 28, 1830. It is based on the life of the Napolitan bandit Michele Pezza, active in the southern Italy in the period of 1800-1806. 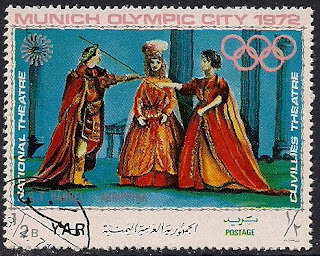 It was considered as the most successful work of comic opera before Offenbach. 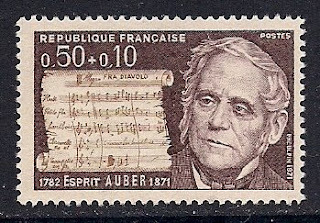 The stamp shows composer Auber and the score page of the opera. 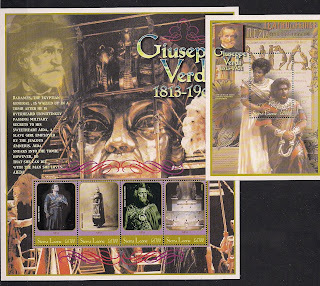 Opera in 4 acts by Verdi; libretto by Antonio Ghislanzoni from the French prose of Camille du Locle, plot by Mariette Bey, premiered in Cairo December 24, 1871. Aida was not, as generally supposed, written for the openning of the Suez Canal(1869), but was commissioned by the Khedive of Egypt to open the new Cairo Opera House the same year.